Last Saturday Grace-Marie was having her Autumn Kitchen Casserole Party at the Cooking School at Bristol Farms in Manhattan Beach and I was really looking forward to it. I love a good casserole, especially when I have to feed a crowd, like around the holidays. 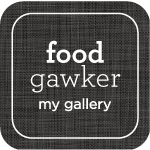 I could hardly wait to see what yummy dishes were in store for me. On the menu were Cheesy Brats and Beer Fondue with Pretzel Bread Toasts, Spinach Spaetzle and Autumn Roasted Vegetable Casserole, Reisling Chicken and Mushroom Casserole, and Apple Harvest “Strudel” Casserole. What a great line-up. 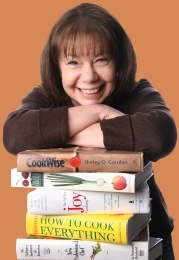 But before I get to the recipe, I would like you to see the classes that are scheduled for the rest of October. We are lucky because Grace-Marie wrote out what is on the menu for each class, so I’m sure you will want to attend each one! Here is the link to sign up. I have to say, in all honesty, this is one of the most delicious chicken dishes I have ever eaten! 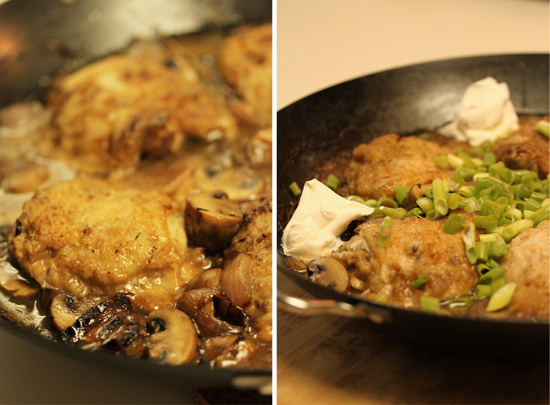 The combination of red onions, mushrooms, chicken thighs, Riesling wine and crème fraishe is just amazing. In the photo above you can see how the chicken first gets a little dusting of flour before being browned in butter and oil. The chicken is removed to a platter and the onions are sautèed until translucent, then the mushrooms are added. When softened, the wine is added and reduced slightly. 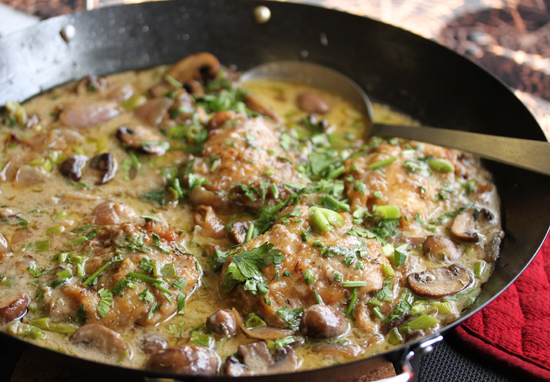 The browned chicken is then returned to the pan and nestled into the mushrooms. The pan is covered and braised until the chicken is fork tender. And moist. And perfect. Just before serving crème fraiche is added to the sauce, along with sliced green onion and Italian parsley. Our chicken was served with spaetzle, but it would be fantastic with nice flat egg noodles. Actually, this chicken would be great served with just about anything. I mean it. 1. Combine flour, thyme, salt and pepper in a large bowl. Add chicken and toss to coat well. 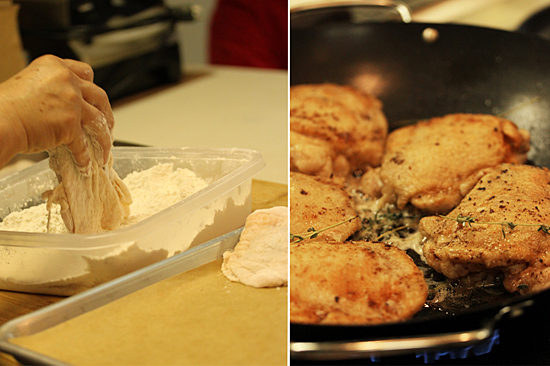 Remove chicken, shaking off any excess flour and transfer to platter. 2. Warm half of butter and oil in a large skillet over medium heat (or use two skillets if necessary). Add half of chicken and sauté until browned on all sides but not cooked completely through. Transfer to platter. 3. Repeat with remaining butter, oil and chicken. Discard flour mixture. Do not clean skillet, but do remove any excessive fat remaining. 1. Reheat skillet with butter and oil over medium heat. 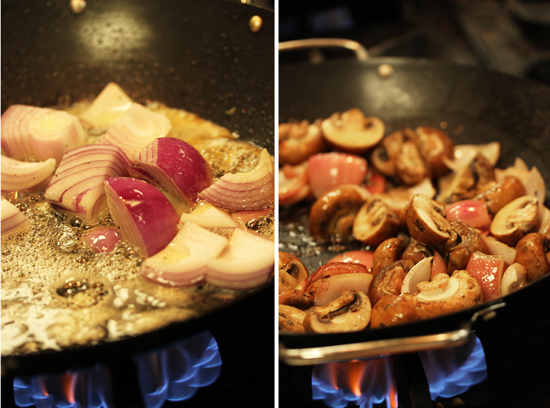 Sauté onions until translucent (3-5 minutes), then add mushrooms. Season with salt and pepper and continue to cook, stirring, until they begin to soften (3-5 minutes). 2. Turn off heat and add wine, thyme and bay leaf. Turn heat back on, bring to a boil and cook until reduced in volume a bit. 3. Reduce heat to low, add browned chicken back into skillet, COVER, and braise until chicken is fork tender (25+ minutes). 1. Just before serving, remove cover and stir in the green onions and créme fraiche. Garnish with chopped parsley. Serve warm along side spaetzle or over any favorite egg noodle. When I think casserole, I think Childhood Dinners Involving Campells Soup With Pasta And Some Meat Thing Baked With Lots of Cheese–very low brow. But this, THIS is a lovely fancy casserole! I love it! Hi Lynne! 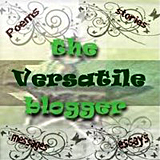 Just found your blog and absolutely love it! This recipe looks fabulous and I’m sure Iwill try it soon. It reminds me of a recipe I made when I was first married, Portugese Chicken, which I think used wine and chicken broth. (Haven’t made it for years, although my hubby loved it). This makes me even more anxious to try this one from Grace-Marie – thanks! Oh My Goodness! My mouth is watering! Will have to try this soon. Who knew chicken thighs could look so appetizing and elegant! I would be proud to serve that to guests! I’m making this right now and serving it with roasted celeriac and parsnips. I’m making this tonight for the family… I’m going to use boneless, skinless chicken thighs (my wife’s request) and will use whatever white wine we have on hand (probably a sauvignon) . Since I’m sure that won’t be nearly as sweet as a riesling, I think I will probably finish this with a touch of honey before stirring in the creme fraiche. I can’t wait to try it! I made a variation of this tonight for my wife and kids. I started with boneless, skinless thighs which I seasoned with salt, pepper, and and fresh thyme and then dredged in flour. I browned the chicken in oil and butter — for about 4-5 minutes on the first side and 3 minutes on the second, then removed to a plate. I then browned the red onions for about five minutes, added the mushrooms and cooked them until softened — I really should have browned them thoroughly but I was a bit rushed. I then deglazed the pan with about 1/2 cup of white wine (I used an orvieto that I had in the fridge) and then added the chicken back to the pan. I added enough chicken stock to reach half-way up the height of the chicken, brought it to a boil, reduced the heat to low and simmered, covered, for about 15 minutes. I checked the chicken for doneness and then let it simmer uncovered for a minute or two just to reduce the braising liquid a bit and give the chicken a moment to dry out on top a little. I tasted the “gravy” for salt and adjusted, then hit it with a small squeeze of fresh lemon juice and finished it with a generous splash of heavy cream and a handful of parsley. I served mine with fresh (store-bought) fettuccine, which I had cut into 2″ lengths before cooking. 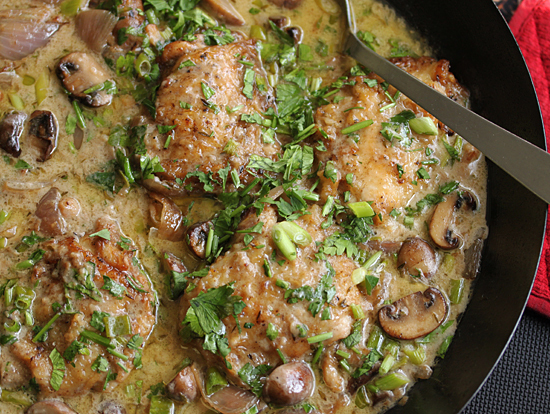 This really was a lovely recipe, and reminded me a lot of my favorite chicken dish — chicken marsala, which I’ve only cooked myself a couple of times. I much preferred this method (braising, that is), and think next time I might try this with marsala wine. Thank you for sharing this lovely recipe and for the inspiration! had it at a restaurant in Santa Cruz. It definitely is the sauce that makes it!